For the Donegal Indians softball team, Tuesday’s District 3 Triple-A semifinal was déjà vu all over again. The Indians upset section foe Lampeter-Strasburg, 4-1 in the District 3 Class AAA softball semifinals at Millersville University on Tuesday, May 31, 2016. Video by John Buffone. MILLERSVILLE — For the Donegal Indians softball team, Tuesday’s District 3 Triple-A semifinal was déjà vu all over again. For the second time in three seasons, Donegal met up with a favored Lampeter-Strasburg team in a semifinal game at Millersville University and came away with victory over their L-L Section Three rival, this time by a 4-1 final, to garner a spot in the District 3 finals. Thursday’s championship game, set for 4:30 p.m. at York College’s Spartan Stadium, will feature No. 5 Donegal and No. 2 Greencastle-Antrim — a 4-1 winner over No. 6 Garden Spot — and will mark Donegal’s third straight trip to the finals. The Indians dropped to Shippensburg in 2014 before defeating Twin Valley a year ago to claim the 2015 title. Top-seeded Lampeter-Strasburg (22-2), meanwhile, will face former Section Three foe Garden Spot (14-8) in the third-place game Thursday with a spot in next week’s state tournament hanging in the balance. That matchup is set for 4:30 p.m. at Garrett Park, Willow Street. The Indians success started with pitcher Makyla Yoder, whose surprise performance as a freshman led to an upset of the Pioneers two years ago, and was once again was the story Tuesday. The junior right-hander struck out four with nary a walk and limited the L-S lineup to four hits, two each from sisters Bri and Hanna Garber. Yoder allowed two-out hits in the first and third, plunking Caroline Braungard with a pitch with one out in the fifth before a line-drive double play to Kaitlin Witmer at second base ended the inning. And by that time, the Indians had a 3-0 lead. Donegal (19-5) put the pressure on the Pioneers all game long. A leadoff walk in the top of the fifth by McKenna Berg off Pioneers’ starter Jordan Weaver (5K, 5BB) was the catalyst, Berg promptly going first-to-third after an error through the legs of Braungard at short on Savanna Kolenda’s hard-hit grounder. After Braungard cut down her second runner of the game at home plate on Morgan Biesecker’s subsequent grounder, Peighton Hornick lined a first-pitch opposite field double to plate Kolenda with the game’s opening run. Yoder followed a two-run single to right for all the margin of victory she would need. Head coach Wayne Emenheiser also talked about confidence especially in regard to the bottom of the lineup. Berg, who aided the Indians’ comeback in a first round win versus Dover with a two-run homerun, drove home Emily Graham with an insurance run in the sixth. The Pioneers’ got on the board in the bottom half on Hanna Garber’s single to center to score sister Bri. The end result, however, is the Indians’ third-straight trip to the finals, coming against another nemesis in Greencastle-Antrim (18-5). 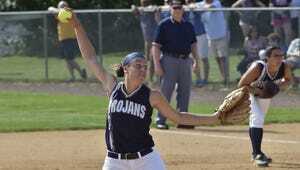 And there’s likely to be some more good softball come Thursday, down Route 83, in York.